Basseterre, St. Kitts (CUOPM) – The Permanent Representative of St. Kitts and Nevis to the Organization of American States (OAS), Her Excellency Jacinth Henry-Martin, has assumed the Chair of the Permanent Council of the hemispheric institution, held during the past period by the Dominican Republic. The diplomat reaffirmed her country’s support for the defense of “all of the values” of the OAS. For his part, Ambassador Vergés, who chaired the Council during the previous period, expressed confidence that the new Chair of the Council will do “an outstanding job,” representing both her country and the Organization. 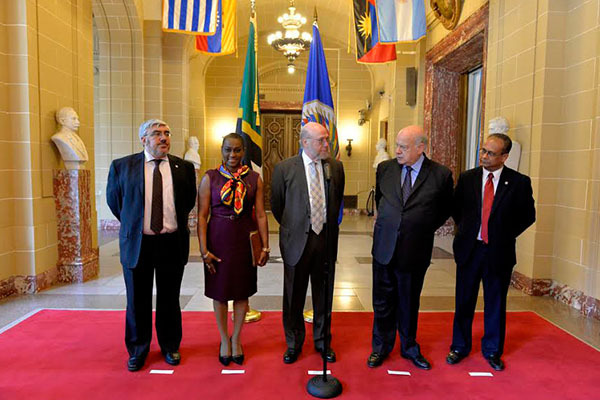 The handover ceremony, held at OAS headquarters in Washington DC, was attended by the Secretary General of the Organization, José Miguel Insulza, the Assistant Secretary General of the OAS, Albert Ramdin and several Permanent Representatives of member countries. The Permanent Council’s statutes establish that the Chair be held by each of the Permanent Representatives in turn, following the alphabetic order in Spanish of the names of their respective countries, and the office of Vice Chair, by identical standards, following reverse alphabetical order. The Vice Chair of the Council will be the Permanent Representative of Uruguay, Ambassador Milton Romani.